GREENVILLE, SC: In a back-and-forth affair with the Greenville Drive on Wednesday night, Diego Rincones threw the haymaker on an RBI-single to break an 8-8 tie giving the GreenJackets a 9-8 victory over the Greenville Drive, Boston Red Sox Single-A Affiliate. Jesus Tona collected his first save of the season and the GreenJackets split the rain-filled series with Greenville while finishing with 15 hits on the night. The GreenJackets got the offense started in the 1st inning. An RBI-fielders choice for Diego Rincones began the offensive onslaught for Augusta. Greenville responded with a run on a wild pitch scoring Kervin Suarez tying the score at 1. In the 2nd inning the GreenJackets tacked on two more runs on a Jeffry Parra two-RBI single making it 3-1 Augusta. Greenville had an answer again though. A four-run fourth inning for the Drive, including a bases clearing triple for Kervin Suarez gave the Drive a 5-3 lead. Starter Blake Rivera was unable to finish the 2nd inning and ends his night after 1.2 innings allowing five runs with four of them being earned. With Greenville leading 5-3, the GreenJackets plated three runs in the 3rd inning. 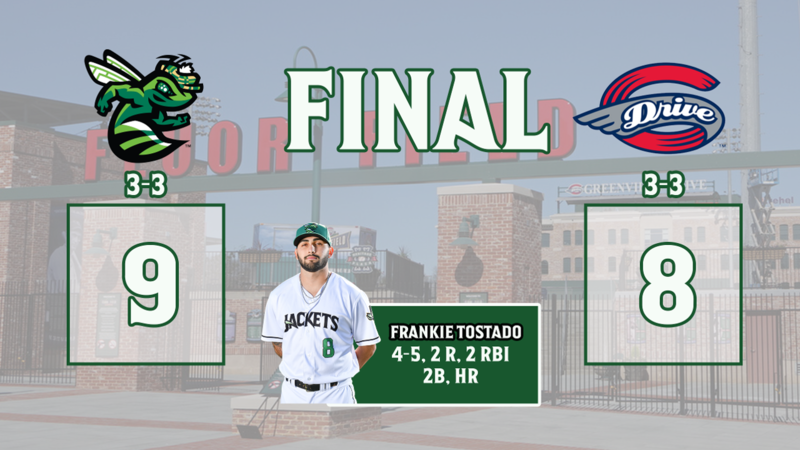 The first run crossed home on an Aaron Bond RBI single, and it was followed immediately by a two-run home run for Frankie Tostado making it 6-5 GreenJackets. In the 4th inning, Shane Matheny added an RBI double making it 7-5 Augusta. Jeffry Parra drove in his 3rd RBI of the game with a single in the 5th, and Augusta took an 8-5 lead. But the GreenJackets bullpen was unable to keep Greenville off the board. A balk from Norwith Gudino allowed Brandon Howlett to score making it 8-6, and then in the 7th inning, Triston Casa hit a solo home run to make it 8-7. An RBI-groundout for Juan Carlos Abreu tied it up at eight, after seven innings. Rincones singled scoring Nico Giarratano from 2nd base in the 8th inning, and the Jackets took the lead for good at 9-8. Tona allowed two men to reach base in the 9th, but shut the door as Augusta held on for the one-run victory. Solomon Bates gets the win, while Miguel Suero gets the loss for Greenville. Augusta goes to 3-3, while Greenville also goes to 3-3 on the year. In a game that saw incredible individual performances all around the lineup, Tostado had as many hits tonight as he did in his first four games. The lefty-bat also had his first home run of the season in the 3rd as he improves the average on the season all the way to .381 on the year. Two right-handers open up the series in West Virginia tomorrow night. For the GreenJackets, Gregory Santos will make his 2nd start of the season. Santos, the #8 prospect in the San Francisco Giants system went three innings, allowing three runs, and striking out three. While the outing started out rough for Santos, he seemed to get better as it went on. Ryne Inman, the Round 15 selection in 2015 out of high school, went four innings out in his first start against the Greenville Drive, allowing four runs while striking out seven. In 2018 for the Clinton LumberKings of the Class-A Midwest League, Inman went 4-10 with a 4.57 ERA. To stay up to date all season long, sign up for the 'Jackets Buzz e-newsletter by visitingwww.GreenJacketsBaseball.com/thebuzz/.